Andrea, Kate, Lynn and Alan all came for a day’s carving over the weekend, and we had unbroken sunshine, it’s starting to feel a bit like spring! Lynn and Kate came down from Tavistock, for the day on Sunday to celebrate Lynn’s birthday (Andrea was a birthday visitor too this weekend). 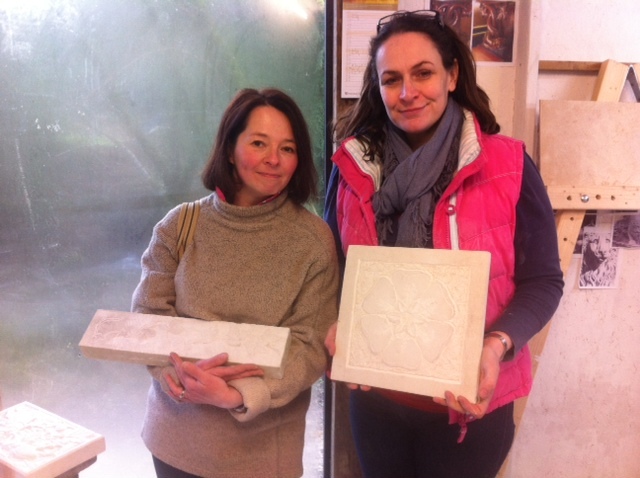 The tudor rose pattern is proving to be popular and both Andrea and Kate made versions of it in relief carving. Lynn made a very elegant ivy pattern on a long narrow piece of limestone and she plans to continue working on it at home. Alan follows in the footsteps of his son Peter, who spent a day with us just after Christmas. He started on a quite large Celtic cross, and will be coming back for our regular Thursday evening sessions to complete it. Thanks to all our carvers this weekend for their hard work and excellent company!